Disclosure-USFAMILY sponsored. My family received complimentary tkts. All opinions are my own. If you are planning to take your kids to the LEGO KidsFest Texas: Limited Ticket Availability to BOTH Saturday, May 18th sessions from 9-1:30 pm and 3-7:30 pm. If you want to guarantee entry, purchase tickets online, in advance to avoid a sell-out. If sold out there will be no tickets available for purchase at the door. Visit http://www.legokidsfest.com/houston/tickets.html to purchase. 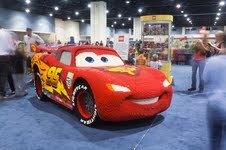 This model of Lightning McQueen is 12-feet-long, 6-feet-wide and made up of 360,000 LEGO bricks. This awesome model weighs 1 ton took total of 2,000 hours to complete. Lightning McQueen was partially built by LEGO Master Model Builder Chris Steininger, who will be at LEGO KidsFest Texas, so feel free to ask him all about it! If I was in Texas I'd love to take my grandson...he would have a blast. My grandson would LOVE to see this in person!! He would be amazed! Sandy and Janet-LegoFest goes all over. Go to their website to see when they are coming to your city. Oh wow. I have never heard of LEGO Fest before! I"m going to have to see if they will be coming to a city near me. With three little boys (and a girl), I think we'd have a blast! LOVE the life size Lightning MQueen!